The Howell family business first opened a butcher’s shop in the beautiful North Norfolk coastal town of Wells-next-the- Sea in 1889. Not surprisingly, the family believes strongly in traditional methods, provided they deliver the quality their customers expect. On the other hand, Arthur Howell and his family are not ones to rest on their laurels – over the past years they’ve opened up a bakery, deli, fish monger and, in the neighbouring village of Binham, a smokehouse. The Williams Meat Ageing Cabinet is a very attractive display unit. The full length glass door and internal display lights ensure the meat is eye catching, while the solid, stainless steel construction looks great and is easy to keep clean and smart. 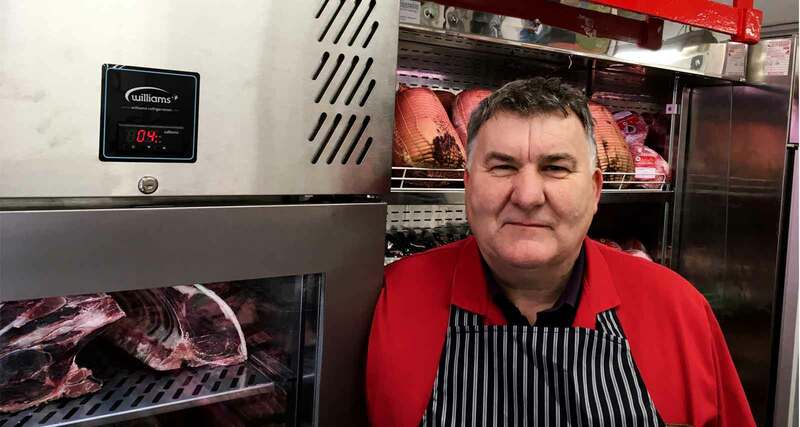 Dry ageing the meat adds to its value – and the price customers are willing to pay. Staff like the Williams cabinet, too. “It’s easy on the eye and it’s easy to look after and clean,” says Arthur. He also likes the solid, robust construction, “The door is nice and heavy,” he says. The Howells have Williams products in other shops, including a Multideck in the deli and a freezer in the bakery. “Another plus with Williams is that it’s easy to get service and to get hold of spares,” says Arthur. The Williams Meat Ageing Cabinet is designed to hold meat in ideal conditions, so it operates at a temperature of 1-4°C and controls relative humidity at 75-85%. The refrigeration system’s CoolSmart controller ensures it always operates safely and as energy efficiently as possible, by only switching the system on when it's required – so during quiet periods, such as overnight, power consumption is minimal. It’s also available in a wide range of colours and textures, thanks to Williams’ Chameleon vinyl wrap service, to match a site’s décor. Made of stainless steel throughout, the cabinet has a capacity of 620 litres and measures 727mm wide by 824mm deep and 1960 high. It runs on eco-friendly natural refrigerant (R290) with low GWP and zero ODP. The insulation foam is precision injected, high density 80mm thick polyurethane, delivering maximum thermal properties with low GWP and zero ODP. 28 days is the minimum to make a real impact on taste and texture. Beef is the most popular meat to dry age, but lamb works well too. If the meat in on show make sure there is plenty of light in the cabinet. Keep meat on the bone during ageing. Avoid cuts like topside: you don't want to much lean meat on the outside edge. Customers like theatre, things that stand out and are different. The Williams Meat Ageing cabinet certainly delivers. It looks great and it looks after the meat really well.